It’s thought that this strategic hillside site once held a fortress in the late 10th century. Archaeologists have determined that a foundation in the northwest corner of the cloister is a Moorish-Arabic tower. Romanesque, Gothic, and Classical architecture was added over the centuries and in the 18th century, the grand interior halls and fountains. Guestrooms in the old wing, although small, have the most atmosphere. Many of them have great views of Guimarães. If you need room to move around in, then go for a room in the new wing. They are very comfortable, traditionally furnished, and have blue-and-white tiled baths. 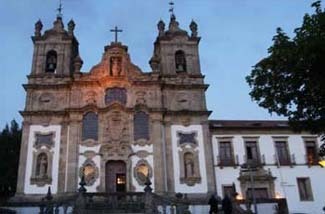 The pousada is 3 km south of Guimarães in the Penha National Park. In a magnificent setting overlooking Guimarães (“the cradle of Portugal”), this pousada ranks as one of the finest in the country. On one side of the monastery stands a wonderful twin-steepled, stone church; on the other side a newer wing blends with the original architecture. Inside you’ll find a stunning array of vaulted ceilings, stone pillars, cloisters, azulejos (tilework), terraces, and balconies. Museum quality pieces fill the public rooms. Long, austere corridors lead to the guestrooms. In the atmospheric, original wing these rooms are installed in the original monks cells, where you have a combination of stone and plasterwork on walls thick enough to hold window seats. More spacious are the rooms in the attached “new” wing. A stone dining room features regional cuisine. During fine weather, an inner cloister with a beautiful stone fountain in the middle opens up to a bar. Surrounding the pousada is a formal garden that extends into park woodland. Gorgeous azulejos dating back to the 18th century.